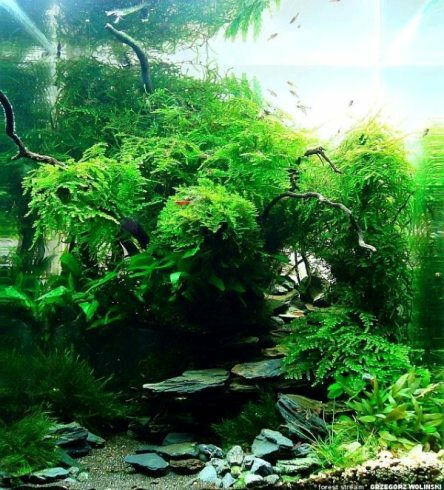 Grégoire Wolinski is a French aquascaper greatly appreciated, his style is innovative, and in Italy Grégoire has many fans. Andrea Perotti interviewed him for AquaExperience. Hello. My name is Grégoire Wolinski, I'm 35 and I live in a suburb of Paris. Currently I have a small business installation and maintenance of aquariums. Firstly I am a lover of nature. I was born in the countryside, surrounded by ponds and rivers. I spent my time playing, fishing at the water's edge to observe nature. I remember a neighbor who had a small aquarium as soon as I had the chance, I would stick my nose in it on the glass. I was fascinated. Then I moved to Paris, but when I had the chance I took my fishing rods and I was going to sit on the edge of the water out of the city to rediscover nature and calm. A few years ago I finally had a home and I was able to realize my dream to have a large aquarium and carry this little piece of nature home. With Internet I discovered Aquascaping and infinite creation. At home I have three tanks: a 250L, a 30L and 20L. Whenever, I try to create something new. This can be a breeding ground landscape like a little piece of nature. My favorite is nutritious soil aqua soil amazonia. I also like to work with any type of sand. 5. How do you manage the liquid fertilization? Do you prefer industrial or self-made products? I did a little diy cocktail that I put in my aquarium regularly. I also have industrial products that I have tested from time to time. 6. How do you manage water changes (percentage, frequency and water preparation)? I try to do my water changes as often as possible plus or minus 20% per week. I use tap water that is very hard in my area. All plants do not like but I'm with. 7. Do you recommend CO2 injection only during the daylight or 24h a day? On my small aquarium I rarely use co2. The 250L I inject co2 24/24 h but very little, a bubble every 5 seconds. I cannot say if it's good I have always done it. 8. Do you use the oxygenator during the night? 9. How do you manage the filtration in your aquariums? Only mechanical or biological too? Which filter materials? I am not a follower of a powerful filter. For filtration I use conventional products supplied with biological and mechanical filters. I also add a bit of lava. 10. Is it important the water circulation in aquariums? Use additional aquarium pumps? Yes traffic is heavy. Personally I do not use additional pump but I try to put my good suction and discharge filter that traffic is done correctly. 11. Do you often test your water parameters? Which are the most important parameters to monitor? Which parameters do you usually keep in your tanks (pH, KH, NO3, PO4, ...)? Normally I never test the water. On my last layout "The Old Guard Creek" I had algae problems that prompted me to do some tests to find out where the problem was, it allowed me to correct the nitrate levels. I also choose fish that do not need specific settings and settings that support relatively large. 12. In new set up, when you introduce the first animals? Who first? The first few are snails and shrimp heteropoda then fish. But I'm still waiting as long as possible before introducing animals, no less than two weeks. 13. Where do you get the inspiration when creating a new layout? The inspiration I get it from everywhere in nature, photos, films, same objects by their shapes can give me some ideas. But my first inspiration is nature. I like to walk along the water, my eyes photographed everything that is interesting and then I try to translate his images in an aquarium. I also think that the most important thing in creating a new layout is to take your time, choose the right equipment, plants and do a lot of testing implementation. 14. 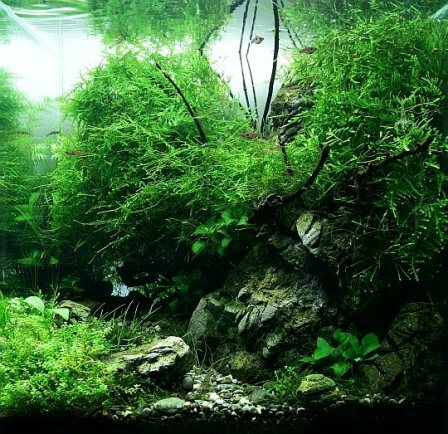 What do you think about Zen philosophy, Iwagumi and landscape layouts in aquariums? This is a question that is both simple and complicated. Zen philosophy for me is a bit of a world apart and difficult to understand especially since it is not part of my culture. I think it is a good idea to emulate this philosophy to create waterscapes and find harmony in this ideology and aquariums. I think it was based on the creation and what we find today in our aquariums. Because of that we may be permitted also to better observe our nature. Ideas provisions stones in aquariums Iwagumi they now also draws our mountains, rivers and forests. 15. You have taken part in some aquascaping contest. What do you think about them? How are important for a aquascaper? And why? Yes I think the competition is important. They encourage us to explore new ideas, to excel and grow. The results are sometimes surprising. I will quote the last preset including the top 200 in IAPLC even if we have not yet seen all the aquariums that have participated. I think part of the aquarium did not deserve to be in the top 200 (déjà vu, retouched photos ...). At the same time, maybe he should just participate for fun and share their creations while ignoring the results. 16. Can you tell us some aquascapers you like the most? I do not really aquascapers preferred. I love the work of those who take risks, bring something new, whether known or beginners, for me the idea that is important. 17. 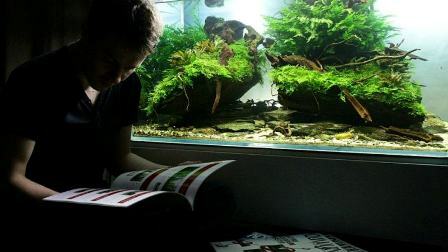 Apart of aquascaping, do you have any other hobby? I like to paint (oil and watercolor), photography, nature walks and cinema. Well, Grégoire, the interview is ended. The Aquaexperience.it staff thanks you for the time you've dedicated to us.